Dried Incan berries can be enjoyed just as they are, added to trail mix or used as an integral ingredient in raw chocolate, biscuits and desserts such as our Incredible Incan Berry and Apple Crumble below. This utterly irresistible Incan berry recipe is guaranteed to have you coming back for more! 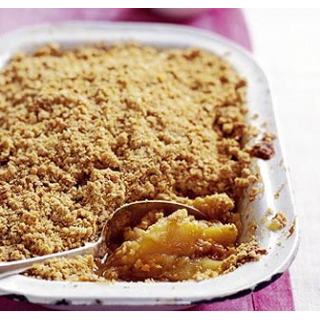 To prepare the filling for your crumble, first pop 3 of the apples, the Incan berries and cinnamon into your blender and blitz to an apple sauce type consistency. Next place the remaining apples and the raw honey into a separate bowl, add in the blended fruit and mix thoroughly. Now spoon the fruit mixture into a cake tin and place to one side. To make the crumble topping, place the walnuts, oats, dates, desiccated coconut, raw honey and Himalayan pink salt into your food processor and carefully grind until a coarse crumbly texture. 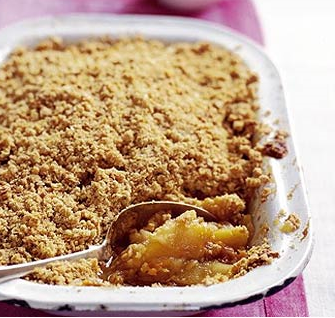 Finally, scatter the crumble mixture over the fruit filling.